← Spring Energy Upgrades: Be A Friend To The Planet & Save Money! When you take over a family business, sometimes it means you can remain committed to the idea of a true, family-run business. This certainly is the case for Sanagan’s Meat Locker, one of the few places in the city where you know you are buying Ontario only meat and other products. It all started when Peter Sanagan was walking through Kensington Market one day and noticed a “For Sale” sign in the window of an historic butcher shop. The business had been owned by the same family for over 50 years, and were delighted to have someone step in and take it over. Within 3 years, the business had taken over a larger space (European Meats) where they could now sell deli and charcuterie products. Then just over a year ago, a second location opened on Gerrard Street. October 2018 marked the first anniversary. “These farms include King Capon Farms, in Sharon, a family owned farm for 65 years, and VG Meats, where 4 brothers took over the family business after their father retired.” Meat and products are sourced from various farming areas in the province, Kitchener/Waterloo for eggs and turkey, Grey County/Bruce especially for beef, Niagara for great prosciutto, Simcoe, Port Hope, Perth and east. The local farming approach means total transparency for the customer. Customers know that Peter or Brian have been to the farms, seen the raising conditions for themselves and how the animals are treated. They can even look at the product label, which states the farm name and location. Both stores follow the same philosophy, although there are more products at the Kensington location, which attracts a wider group of shoppers. The Gerrard store is basically a community store, which Brian loves. “It’s a typical neighbourhood, where people drop in to buy products to take home to cook, or pick up in the deli area,” he says. Popular items include prepared foods like meat pies, terrines, and many sausage varieties. “We are also starting to stock some traditional British products such as pork pies, bangers and sausage rolls (coming soon). 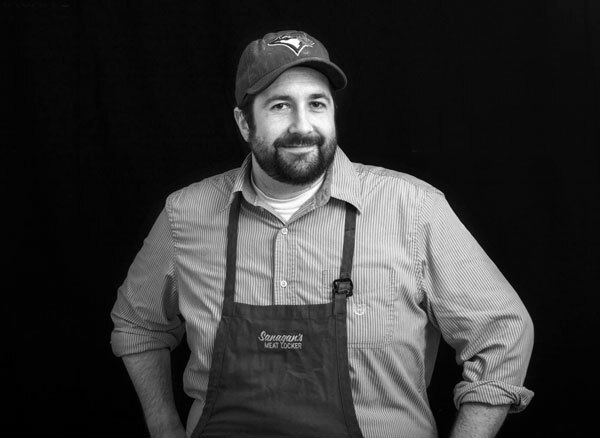 After spending 15 years in some of the best kitchens in the city, then as chef at The Falls Inn in Grey County, he discovered the quality of food produced by small farmers and difficulties they faced getting their goods into large city stores. This is especially the case for meat. Both Brian and Peter grew up in Toronto, “We are just so happy to be part of the Gerrard community,” they add.